First off, I created my character on the assumption that I would eventually be playing full time with the Havok! LARP group. 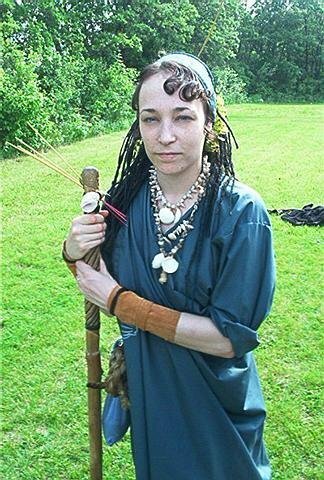 The Game Administration person (user name Anorll) had actually started telling me about the game one night when I had complained about the lack of any good LARP’s within our city. He explained that alot of the combat and static challengers were basically done as is. No rock, paper, scissors game to decide the outcome of contests and no dice rolling. Interested in this new game (New for me, the game had been running for about three years at the time I joined), I decided that I wanted to play. I was looking for a new Roleplaying Challenge, and I believed I had found it with Havok! To start playing however, I needed a rulebook for basic character creation, description of the world and rules of combat and magic. I also learned about much of the Game’s World History though talking with the administration and looking over the game’s 2nd Edition PDF rulebook, which was only available to members at the time. Eventually, I sat down and developed a character sheet for my character. 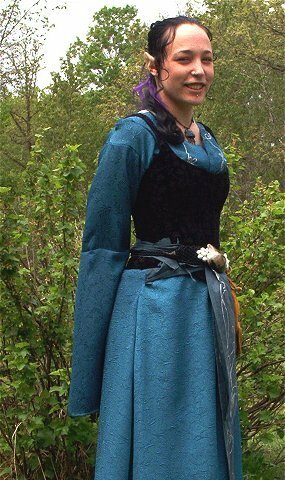 I had decided I wanted to play an Elf, as I am partial to elves and always have been. So I poured through the Rulebook and found the information dealing with the elves in this game. The rulebook stated that I didn’t really need the pointed ears to play an elf, but I wanted to find some for my character at some point in time. As elves, we also get certain racial bonuses and drawbacks. I listed these down on my character sheet, chose my character’s age in elven years and then had the dubious task of choosing skills and Advantages for my character to reflect who and what she was. I decided to set that aside until I could come up with a more developed character concept and background history. Because I had no actual experience dealing with the Game as a player, I opted to play a character that would not be on the front lines of a fight. This basically meant that because I had no experience as a fighter, I decided to play a magic user. There are three types of magic users in the game; Theomancers, Cabalists and Shamans. I didn’t want to play a Theomancer, as their magic was completely determined on the connection with the God the character worshipped Cabalists are basically the equivalent of Sorcerors and Mages, where their spells are learned from books and scrolls. I wasn’t really interested in playing one of them either. I eventually decided on the Shaman magic class for several reasons. I had played a Druid character once before in a tape-top game, and I enjoyed the concept alot, and two, I had never played a character that dealt with spirits for magic before. Alot of the character’s druid-like concept was actually derived from books on the Druids, which I was able to get from various Pagan friends. With my character class in mine, I began to flesh out my character’s abilities and advantages, and give my character her background history. Also at the time of character creation, I took several flaws that would account for my lack of involvement in the first few games I played. Two of these flaws were that my character was extremely shy and the other extremely fragile. With these two flaws (which I eventually bought off during the course of time with the experience points I gained through play) I set out to make myself a costume and get myself a pair of ears. I played for that year as often as I could, keeping in mind my character’s flaws and such. It made for interesting conversations and such, especially when my character would talk randomly to thin air (one of the character flaws I took was the ability to see and hear spirits without having to go into the Dream Worlds), even though she could see and hear the spirits she was talking to. She was shy, retiring and non-confrontational. The character history I had developed for her was she had been caught in the middle of a War that had JUST ended, and thusly, she was suffering from Combat Stress Reaction because of it. She only interacted really with a few people, and by the end of the year, I was able to buy off the frail flaw. This was also the point where part of my character’s history was introduced to the game as a whole, though only in bits and pieces. My second year of play was when the second Lord of the Rings movies came out on screen. It was a big deal and the movies provided alot of inspiration for me as a player. I wanted to develop my character and my costume to reflect what Peter Jackson had created on the big screen, with of course the adaptations to fit the game genre. With that in mind, I began to have my character pose as more aloof than previously played, as well as not overly emotional as I played her before. People had commented on the change, which I explained in character as the influence of the totem my character followed as well as coming of age. Character-wise, Mae’hriel (the name of my character) had begun to learn to trust people more and more. She became involved in meeting new people and began learning more about her Shaman abilities. More of my character’s background began to come out that this point, which created a bit of tension and dilemma between the characters that had begun to consider Mae’hriel their friend. They understood that alot of what was happening was not Mae’hriel’s fault per se, but they understood that she was an indirect source of the problems. She was also becoming more sure of her abilities and strengths, as was tested during a game where we were 30 second short of complete destruction because of an elder Vampire awakening. My character was a key player in that game, having the ability to place spirits in objects. This gave both myself and my character a great sense of accomplishment, and gave way to more in-depth character exploration. She still kept to the main body of the adventuring party though, and lodged during the winter with a few close friends in the game. She also at this time met another character who was from a country called Draco, and began to develop a shaky friendship because she healed him after he was injured in a 5 on one fight with lizard-like creatures that had been changed through wild magic. My third year playing is about to begin, though I have been doing the “Play by E-mail” route to get a few things done for my character over the winter. (Our group plays outdoors, so our games are completely dependant on Mother Nature.) The Lord of the Rings movies have actually prompted me to try and learn Sindarin for the game. My character and three others are venturing into the country of Draco to look for keys to Mae’hriel’s past. So far, things have been going quite wonderfully, though we’re still technically at the beginning of the adventure. Another of the players will be joining our group shortly. Mae smiled slightly at Knucklebreaker, rubbing her hindquarters with her hands. Mae looked at Knucklebreaker in horror, however, when he mentioned eating of dead enemies. She frowned deeply at this and her eyes bespoke of a hidden knowledge. “No Knucklebreaker, I would not eat of this flesh if I were you.” she spoke in just above a whisper, gently placing her hand on his massive forearm and giving it a tight squeeze, before she released herself. She listened to Thorne speak, noting the pace and tone of his voice. Whether it was his military training taking effect, the weariness of the fight, the shock of being attacked or the magicks used in the battle, Thorne was avoiding telling Propheus and Knucklebreaker what was going on. This too she frowned upon, also remembering what the Aven’Tarum had written in the letter to her. She bit her lip, regarding Thorne and the other Dragoons with a slight air of mistrust, before she shook her head lightly. The Caravan was leaving for the Star’s Keep, and Mae’hriel was supposed to be on it. It struck Mae as strange how the Caravan would still be leaving so closely following an attack, especially one directly on the Dragoons themselves. This worried and comforted Mae at the same time. Worried her in the fact that The Dark One was already seeking to cause discord and disruption within the Dragoon ranks, yet comforted that, at least this time, he had not come looking for her. Someone had once told her, the closer you are to danger, the further you are from harm. She thought it most applicable in this case. Mulling over her thoughts in her mind as she walked with the group towards the Caravan, she hadn’t spoken a word. Her left hand absently lifted and touched the remaining portions of her ear. She was right when she had spoken with her mother last night at the Teth’lin Springs…she had lingered here in Teth too long. “Naneth…” she sighed gently, looking towards the springs briefly. She hadn’t realised that they were standing in front of the Caravan, waiting on Mae to at least say or do something. She regarded all three of them slowly, then offered Propheus and Knucklebreaker a small smile. “I can call upon the kinsmen to the Sea if I need. Tavari rasa nin naneth…(The Sea Spirit is my Mother), she will always rise to defend her daughter.” She explained, placing her arms wide to touch them both. Assuming both of them knew the Elven language, they would know that Naneth literally meant “Mother”, the one who gave birth to Mae herself. With a gentle shrug, she embraced them both, wishing them both well on the journey back over the Deepening Wall and to the WormSchloss Festival. She turned to Thorne then, regarding him with uncertainty of how to approach him. She sighed gently and took his hand in hers, gently placing her fingers in the center of his palm. “Lies are like the small seeds we plant during the Autumn before the first winter snows fly. Left all winter, these small seeds begin to fester and grow, so that by the time the Winter snows melt under the warmth of Spring, they are rampant like weeds. Keep in mind, that you are not the only one who does the planting meleth nin….there are others. What happens when two weeds grow together at the same time, within close distance to each other?” as she spoke the words, her fingers gently began to force themselves outwards against the leather of Thorne’s glove, but it would still be enough for the effect she wished. Regarding Thorne briefly and releasing her grip from his hand, she sighed gently, then offered him a sweet smile. Not being able to stay angry with him for long, she stepped forward and embraced him if he would allow. “Your friends are with you Anorêl, and my heart goes with you.” she hugged him tightly, remembering the smell of his neck and tunic. Stepping back, she looked at all three of them. Finding a spot where she could climb up on one of the wagons, Mae quickly climbed it and seated herself at the edge, watching the three of them. She waved at all three of them, holding a hand over her heart. “We will meet again soon.” she smiled, giving them all a slow nod of her head. She was ready to go, though it pained her to leave them, especially now. I also made myself a new set of synthetic hair, using a different method that before. I used four packages of high quality synthetic hair and braided it with a wire headband. Again, there are more details on this in my other article. Mae’hriel now is learning more about the different aspect of herself, dealing with feelings and thoughts she hadn’t previously experienced. One might even dare say that love is in the air for my character, though it certainly was not an intended thing. She is now beginning to learn about remnants of her past, and that what she had considered home is now beginning to not actually be her home. It’s hard to explain really. But the storyline deals with Mae’s desire to belong somewhere and have what she calls family. The three (soon to be four) she travels with are what she considers family, and they actually have formed a new noble house together. The Havok! Season starts up again as soon as the snows are gone and it gets warm enough to play outdoors again. I’m looking forward to playing this year (as always) to see what new developments are in store for my character. Again, well done! Love your costumes!